"In my productive activity, every time a type grows beyond the stage of its genesis, and I have about reached the goal, the intensity gets lost very quickly, and I have to look for new ways. It is precisely the way which is productive -- this is the essential thing; becoming is more important than being. Graphic work as the expressive movement of the hand holding the recording pencil -- which is essentially how I practice it -- is so fundamentally different from dealing with tone and colour that one can use this technique quite well in the dark, even in the blackest night. On the other hand, tone (movement from light to dark) presupposes some light, and color presupposes a great deal of light." My first attempt to make a screen print has failed. 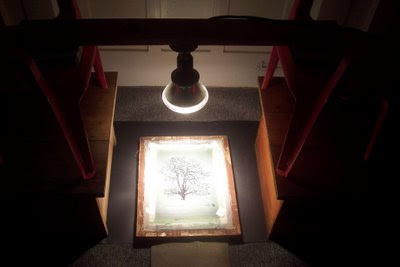 The image, a detailed drawing of a tree, was ideal for a photo stencil, so yesterday I prepared the screen with photo emulsion and left it in the dark to dry. Today I set up the light -- a 150-watt flood lamp attached to a piece of 3 x 1" board -- and gave the screen an exposure of 24 minutes. 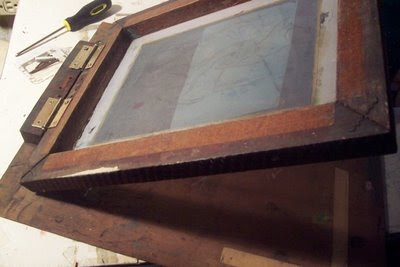 Sad to say, the unexposed parts of the screen (the drawing) failed to "open" properly afterwards and in the end I had to abandon it and wash out the whole screen, which was pretty difficult to do. It took over an hour of scrubbing and washing with chemicals. I think the exposure time was too long. I will try again with a shorter exposure and possibly raise the lamp a couple of inches. I can't complain, having skipped the step in the reference book* which recommends doing a series of timed test exposures. Hockney's big Yorkshire landscapes done in 2006-2007 came as a surprise. Last I knew, he was doing large double portraits on four full sheets of watercolour paper with the subjects sitting on swivel chairs. It was a long series and they're already looking better as time goes by, though it's getting more difficult to find good examples on the internet, as the poor quality of the National Portrait Gallery image shows. Then there were the dog paintings which brought him widespread scorn. These were and are considered trivial and sentimental, a view I do not share. At the very least, the length of the series shows Hockney's commitment to hard work. Before that he did a series of landscapes in California, of Mulholland Drive and Nicholl's Canyon. These were large and colourful with the landscape spread out as if seen from a high viewpoint or even from the air. A few years ago I thought they might have been a little forced but now they're growing in stature, so to speak, and are fascinating images, visual extravaganzas. A later painting of the Grand Canyon is on sixty canvases. In the 1980s, Hockney did his cubist-inspired photo-collages, with multiple shots taken from different angles and then cut up and pasted together, as in the iconic Pearblossom Highway (1986, photographic collage, 198 x 282 cm.) These too did not receive much critical acclaim but once again they are looking better with the passage of time. Furthermore, one can see how these cut-up and juxtaposed images could have led to his subsequent work -- the double portraits on four sheets of paper, the Grand Canyon paintings made up of dozens of smaller canvases put together; and now the monumental landscapes of East Yorkshire, each on 10 or 12 canvases. The biggest one is on fifty canvases and was painted for the Royal Academy's 2007 summer show. Astonishingly, the Yorkshire landscapes were done outdoors, from life. Thus, Hockney achieves the spontaneity of painting outdoors at a scale never attempted before, to my knowledge, underscoring how innovative and exciting these pieces are. Hockney's process involved transporting all his gear in a pick-up truck and setting up several easels together; and then working furiously for several days in succession. He might have had a tent as well, and helpers to lift and carry and set the equipment up, but I'm just guessing. This link tells how he used digital technology to help him see the painting's overall progress as if he was standing back from it. It also has a photo of Hockney outdoors, at work on an array of easels. However he did it, I have the greatest admiration for the work. His strength has always been his gift for drawing which for the last fifty years has been a liability. Hockney plodded along on his own path, disregarding fashion and doing what he did best. Just turned 70 and with a huge body of work behind him, he didn't stagnate, he's still breaking new ground, and you have to admire that. The only problem with Hockney now, and it's a disappointing one, is the lockdown on images. Unfortunately good examples of his work are becoming harder to find on the internet because of strict enforcement of copyright. Artists get known through their work being seen and it's risky to prevent people from seeing it. Hockney may be sufficiently well regarded now that he can afford to do this, joining the ranks of only the most illustrious of painters such as Picasso, Klee and Warhol, but it antagonizes many in the Wikipedia and Open Source generation and is potentially counter- productive. For myself, I declined to go further when I met the "STOP" sign on the official Hockney website. 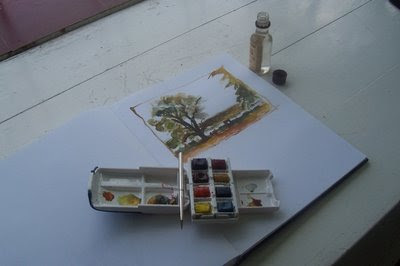 The watercolour kit is now complete. I added a brush in addition to the one that came with the paint box. The new brush is a Rowney series S 34 sable, No. 4, and it has a great point and good spring. It came with a clear plastic guard which fits over the hairs to prevent damage from bending, e.g. against the side of the case. 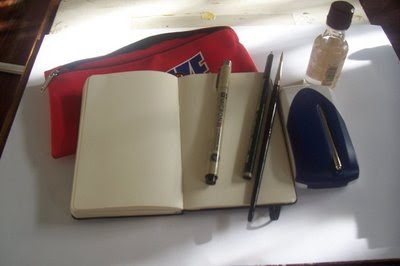 Here's all the stuff together: a zipper pencil case, a Moleskine sketchbook/notebook about 3 x 5", a Micron 05 black pen with archival ink, a pencil, the sable brush, the paint box and the water bottle. It all fitted in, really! And there's room for an eraser, a sharpener, and a folded tissue as a rag. 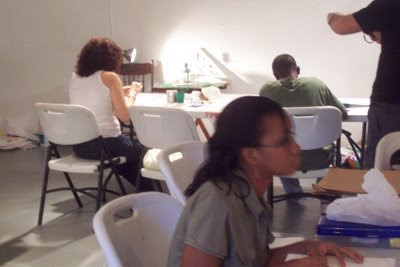 The Plein Air group held a well-attended still life studio last Saturday at the Art Society building. Peter Sheppard arranged it and brought props (flowers and fruit, pots and pans) for four set-ups. Tables and chairs were in plentiful supply because of the current children's art camp organized by the art society. I took along drawing gear as well as acrylics and a canvas, which turned out to be overly optimistic. 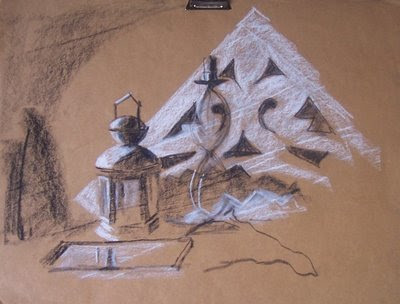 I arrived late and left early and did only two drawings in the end, on brown paper. Which brings up the matter of brown paper. 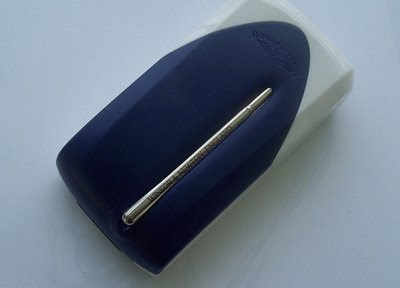 It's cheap, which encourages using it freely and doing many drawings. Apart from being cheap, I like it because it gives you a middle tone to work out of. It's ideal for quick compositional studies with charcoal or Conté, either black and white or a range of colours. On Saturday I did one of each, not very good but shown below anyway (about 16 x 20 in. each). Brown paper takes gouache fairly well too. 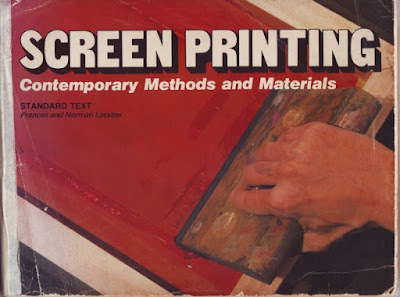 But for wet media it's nowhere near as good as real manila paper, which disappeared off the market about ten or fifteen years ago, maybe more. Manila paper was cheap, tough, excellent to work on with both wet and dry media, and the plant it was made from (hemp) was easy to grow in large quantities. I tried to find out what happened to it, and the only explanation I could find is that the plant may have been banned under the international drug laws. I don't know if this is the real reason and haven't researched it recently, that was a few years ago. It's taken a while but finally, after some unforeseen delays, I got replacement hinges for the old screen. I put them on last night and here are two pictures. 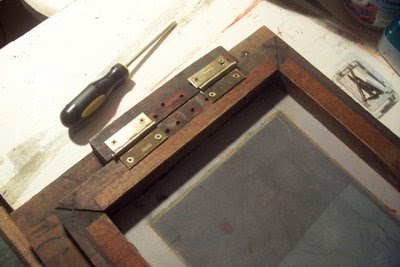 The first one shows the newly-installed hinges, and the second shows the screen propped up, as it will be in use, e.g. when changing the paper. Ideally it would have a swing-arm on the right (far) side to prop it up in between prints, but for now there's a clothes peg holding it up. In the first picture you can just about see the removable pins in the hinges, both facing away from the centre. They're rather stiff, hope they'll get easier to remove and replace over time. Or maybe I should oil them. But I must produce something with it before I can say that. I've been feeling a need to add colour to my sketchbook, so I went looking for a small neat folding watercolour kit. 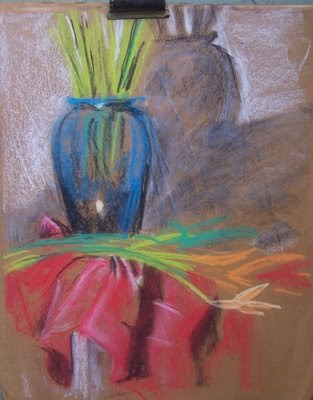 Pastels are fine except for smudging, and I do use them outside, but not in a standard sketchbook with white pages. Gouache would be good too, didn't think of it at the time. Coloured pencils are too slow and need too much pressure. Watercolour pencils aren't bad. Markers -- well, it's no harm to have them but I don't use them much. Watercolour it would be. I found dozens of watercolour kits in all price ranges, some quite elaborate costing over US$100, but I was looking for something simple and inexpensive. I settled on the little box shown here and am very happy with it, except that the brush is hopeless. 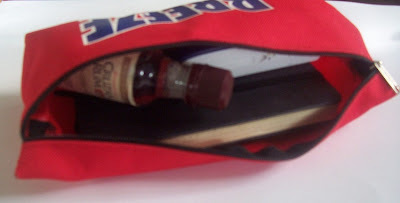 The box, along with a much smaller sketchbook than the one shown*, and a tiny water bottle (a reclaimed airline rum sample bottle), fits in a zipper pencil case, good to go. The kit performs well in actual use (apart from the brush) -- the pans have body and moisture and you can work up a good thick brush-load of colour. Actually, the brush isn't hopeless, it has good spring, it's just very small and thin. One of the things I like about this particular kit is that the colours are mostly permanent except for Viridian and Alizarin. Not that permanence is an issue in a sketchbook, but even so. As for the brush -- I'll get a thicker one as well and cut the handle down to fit in the pencil case. The kit closed. The silvery thing is the brush slotting neatly into the cover. *The sketchbook in the picture is hardcover, 8.5 x 11". ambiguities, the marvellous atmosphere of untruth; and I am interested in his methods and find them very sympathetic, but his imagery -- the shadow of a magician against a shimmery curtain, and all those sugared violets -- is not mine. The house I was raised in had its charms, but my father hung his underwear from a nail he had driven into the back of the bathroom door, and while I know something about the Riviera I am not a Russian aristocrat polished in Paris. My prose style will always be to a degree matter-of-fact."